BOSTON - Evan Longoria had gone 26 games since hitting a homer in the season opener. His power stroke returned Wednesday night. Tampa Bay's cleanup hitter hit two homers — the second travelling 454 feet in the ninth inning — and the Rays beat the Boston Red Sox 5-3. "I guess, eventually, it had to happen," Longoria said. His second homer of the game provided a cushion after Kevin Jepsen worked out of a one-out, bases-loaded jam in the eighth. He got Daniel Nava to ground to first baseman James Loney, who got the force out at home. And Brock Holt grounded to Loney for the final out. "Nava's such a tough guy to get to hit a ground ball," Rays manager Kevin Cash said. "Credit Jep for making a pitch to get the ground ball." Joey Butler had given the Rays a 4-2 lead with a two-run single in the sixth, two nights after hitting his first major-league homer. The Red Sox cut that lead on Mookie Betts' fifth homer of the season, his third in two days, leading off the eighth against Jepsen. 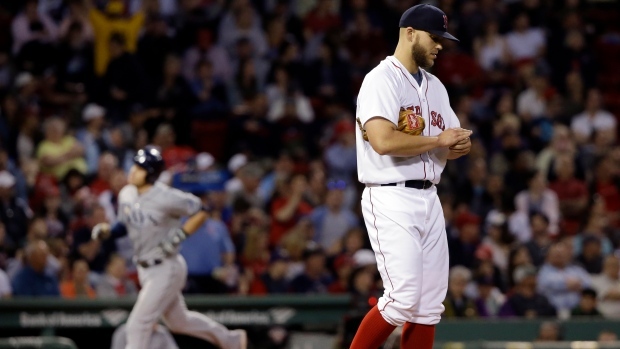 Then, after Dustin Pedroia grounded out, the Red Sox loaded the bases on a walk to David Ortiz, a single by Mike Napoli and a walk to Pablo Sandoval. But Luis Jimenez pinch ran for Ortiz and came up with runners at first and second and two outs in the ninth. Brad Boxberger wrapped up his seventh save by getting the light-hitting Jimenez to hit the ball a few feet in front of the plate for an easy out. "With (Ortiz's) run being the tying run there, if we get a base hit and he gets thrown out at home plate, you're damned if you do and damned if you don'," Boston manager John Farrell said, "but we had multiple opportunities there in the eighth inning." The Rays had taken a 1-0 lead against Justin Masterson (2-1) in the third when Brandon Guyer doubled and scored on a single by Logan Forsythe. The Red Sox went ahead 2-1 in the bottom of the inning against Alex Colome (2-0) on consecutive doubles by Xander Bogaerts and Blake Swihart and a sacrifice fly by Pedroia after Swihart moved to third on a groundout. Longoria tied it in the fourth with a leadoff homer to left. "It's become more and more difficult in this league to hit," he said. "Luckily for me, the team was winning ... so it doesn't put a whole lot of pressure on me necessarily to hit home runs." Masterson retired the leadoff batter in the fifth, then let the remaining four hitters he faced reach base. Loney singled before Longoria and David DeJesus walked, loading the bases. Butler followed with a single to right, scoring Loney and Longoria for a 4-2 lead. Butler was called up from Triple-A Durham on Sunday and made his 2015 debut that day against Baltimore. On Monday night, he hit a two-run homer in Tampa Bay's 5-1 win in the opener of the three-game series in Boston. The Red Sox left nine runners on base and are 4 for 45 with runners in scoring position in their last six games. "We've done a good job of creating opportunities," Farrell said, "but we haven't been able to cash in." Cash was the catcher in Masterson's major league debut on April 24, 2008, with Boston. "It was kind of funny. Most guys get their debut and there's a lot of anxiety," Cash said. "I'll never forget Masty talking to people in the stands" during his warmup session. "After he threw 19 pitches he flipped the ball to (then pitching coach) John Farrell and said, 'Wherever the path leads me.'" Masterson left after 6 innings with a 3-1 lead, the only run a homer by Napoli. Rays: LHP Jake McGee (off-season elbow surgery) and INF Nick Franklin (left oblique strain) both did well in rehab appearances Tuesday, according to Cash. ... The Rays expect to learn more about RHP Alex Cobb's pitching elbow after returning home for a four-game series against Texas starting Thursday night. The Tampa Bay Times reported he has a partial ligament tear. Red Sox: RF Shane Victorino is scheduled to start a rehab assignment Friday at Double-A Portland. He is on the DL with a right hamstring strain. ... LF Hanley Ramirez remained day-to-day after spraining his left shoulder when he ran into the side wall in left field pursuing a fly ball on Monday. Rays: RHP Chris Archer (3-1, 1.64 ERA) pitches against RHP Nick Martinez (2-0, 0.84) and the Texas Rangers on Thursday night in the opener of an eight-game homestand. Red Sox: After a day off Thursday, LHP Wade Miley (1-3, 7.15) faces RHP Aaron Sanchez (2-2, 4.62) of the Toronto Blue Jays on Friday when the Red Sox open a three-city, 10-game road trip.